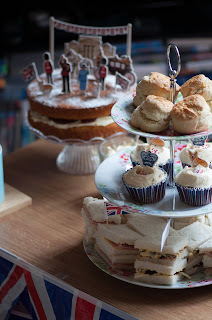 Another post which shows how woefully behind I am with blogging... there was no way I was going to let the Queen's Jubilee pass without baking something, but the afternoon tea baking marathon I ended up on was even more than what I had originally had in mind! I didn't realise that I'd been stockpiling Jubilee decorations, and well, it would have been rude not to have used them all! Here is a breakdown of what was in my spread. First up: butties. Featuring sandwich flags! Is there anything more pleasing than sandwich flags?! I made cheese and pickle, ham, tuna and cream cheese and cucumber. Next layer for the tea stand: Earl Grey cupcakes! Decorated with a fab Jubilee cupcake set I got for my birthday and some Union flag coloured sprinkles. 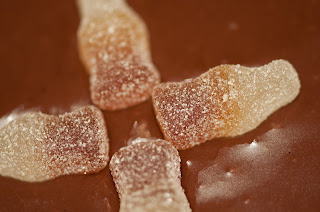 The theme for the Chester Clandestine Cake Club in June was 'mystery ingredient' and after a work colleague mentioned a cola cake she had tried in the past I decided to give that a go, especially as I have a boyfriend with a cola addiction. It took a while to sniff out a recipe but I eventually found this one, a James Martin one from the BBC website. Well, the test bake was a disaster! To be honest, it was so long ago that I can't remember exactly why it was a disaster, but I'm fairly sure it was something like the cake mix seemed too runny and after giving it double the time in the oven it was burnt around the edges but sludgy in the middle. Yak! This the third and final installment in my Cakes Not From Kim mini London series! I was, for some reason, SO EXCITED about finding Lola's when we were in London. I have just loved Lola's from the second I got the book - I love the branding, I love the book and both of the recipes I had tried from the book were delicious (if you ignored the burnt tops of the cherry cupcakes, but that was entirely my fault!) and easy to follow. And there is so much more that I want to try from there! The excitement had already built up because we had been in Harrod's and seen the Lola's concession stand in there, but I had forced myself to ignore it because I wanted to wait to see the place that was purely Lola's, and so we ended up walking from Harrod's across to Lola's at 16 Lansdowne Row, Berkeley Square, W1J 8QF. So after my trip to the Hummingbird Bakery, I was inspired to try out some more of their recipes and the very next day made the Earl Grey cupcakes. I'm not sure why I chose them, since I don't really like Earl Grey, but I have seen them mentioned on several blogs, and I knew of a few Earl Grey fans I could pass them off onto if needs be! I won't post the recipe as I have seen it on many blogs (here's one with particularly lovely decorations: Laura Loves Cakes), but I followed it to the letter, determined not to mess it up this time. I even tried to swirl the buttercream on with a palette knife, a technique that I have really struggled with before for some reason. And I am please to report that....IT WORKED IT ALL WORKED! I have had a bit of a chequered history with the Hummingbird Bakery, it is one of those things that I feel like I should love - the books look great and everything bangs on about them all the time. But the one recipe I tried just didn't work - and it was only vanilla cupcakes, how can you mess them up?! - and so I had been hesitant to try anything else. But when I was in London I just knew I would have to visit, and so we went down to the South Kensington branch (47 Old Brompton Road, SW7 3JP). We went just after breakfast on the last day of our trip, and neither of us wanted to stay and eat, so we got some stuff to take away and haul back on the train with us. We chose a big slice of red velvet cake and a whoopie pie, and two cupcakes. I loved the packaging, which was nice and sturdy and meant we got all our goodies back to Cheshire in one piece and not just a mound of crumbs as I was fearing! It also made the cakes feel lovely and luxurious, like a proper treat.